Our work with youth facilitates their empowerment and inner transformation. MISSSEY was founded by two survivors and two allies who came together with the purpose of helping CSEC victims and centering the voices of survivors. Since its inception, MISSSEY has served nearly 1,000 young people in what the FBI has identified as one of the top hubs for human trafficking in the nation. Our programs are trauma-informed: services are rooted in the understanding of the vulnerabilities and triggers of victims and survivors. Our goal is to provide a safe and loving environment for those we serve, and to lift up these youth so that they can have successful, independent futures. Our service model is not only trauma-informed, but survivor-centered and youth-focused. We recognize the crucial voices of survivors in facilitating healing in victims of commercial sexual exploitation and the value of young people empowering other young people. 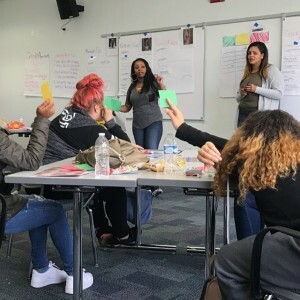 Our work with youth is a partnership, helping them transition from victim to survivor to leader, encouraging their long-term stability and success in whatever path they choose. If you have any questions concerning the referral process, please contact MISSSEY at 510-251-2070 or email us at directservices@misssey.org and we will follow up with you. "MISSSEY has a history of dedication to commercially sexually exploited girls that is honored and respected both nationally and locally. MISSSEY is central to the movement because of its expertise, passion and demonstrated commitment."